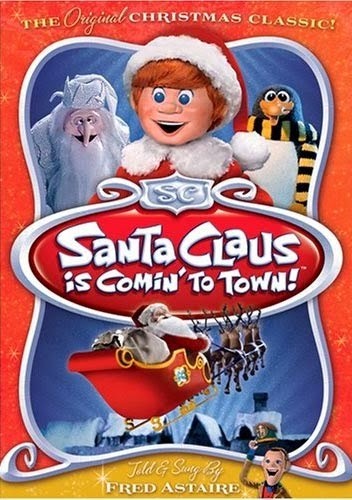 Rounding out the Rankin / Bass Holiday triumvirate (along with Rudolph, The Red-Nosed Reindeer and The Year Without a Santa Claus) is the 1970 animated Christmas special, Santa Claus is Comin’ to Town, a musical adventure hosted by Fred Astaire that details the history of Santa Claus, while also revealing the origins of some of our most time-honored Christmas traditions. Narrated by deliveryman S.D. Kluger (Astaire), Santa Claus is Comin’ to Town takes us all the way back to when Santa, aka Kris Kringle, was a baby, left on the doorstep of the mean-spirited Mayor of Sombertown, Burgermeister Meisterburger (Paul Frees), who immediately ships the infant off to a family of toy-making elves named the Kringles. Once a man, Kris (Mickey Rooney) sets to work delivering the toys that his adopted family makes to the children of the world, only to come up against Burgermeister Meisterburger, who immediately outlaws all toys. With the ban in place, Kris becomes a wanted man, and does his best to avoid capture, all the while steering clear of the evil Winter Warlock (Keenan Wynn), who guards the path through the mountains. Ever wondered why Santa wears a red suit? Why he flies around with 8 reindeer? Then you’ll want to check out Santa Claus is Comin’ to Town, which provides answers to these questions, and more besides. 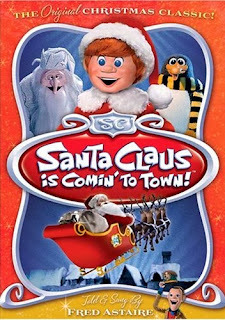 As the voice of Kris Kringle, Mickey Rooney does a fine job (he’d reprise the role four years later, in The Year without a Santa Claus), facing off against not one, but two adversaries (I used to be scared to death of the Winter Warlock, but as it turns out, Santa’s real nemesis is the Burgermeister Meisterburger). Along with presenting Santa’s origin story, Santa Claus is Comin’ to Town features several entertaining musical numbers, like the title song (performed by Astaire) and “Put One Foot in Front of the Other”, in which Kris Kringle, having shown the Winter Warlock the true meaning of Christmas, helps the creature become one of the good guys. While I definitely prefer Rudolph and Year Without, Santa Claus is Comin’ to Town is an entertaining Christmas special, and yet another Holiday classic from the creative minds of Arthur Rankin Jr. and Saul Bass.